UPDATE: Initial reports about McDonald's offering a monster 48-piece chicken nugget bucket were sadly false, as it turns out the hype was just old news resurfacing from 2015. We apologize for getting this wrong, and we regret the error. Original story: Surrendering to the voice in your head telling you to treat your body like a garbage dump has never really been that bad of an idea. McDonald's never fails to hold true to this conviction. The latest offering from the fast food behemoth is a bucket of 48 chicken McNuggets. It's a glorious sight and quantity of food. Sadly, the order is only available in Japan, where food is often cooler than it is here in America. Oh, well. But since that primal hankering for McNuggets effects almost everyone, everywhere, we'll provide the details. You're probably wondering why McDonald's didn't splurge on a nice, cool 50-McNugget bucket. 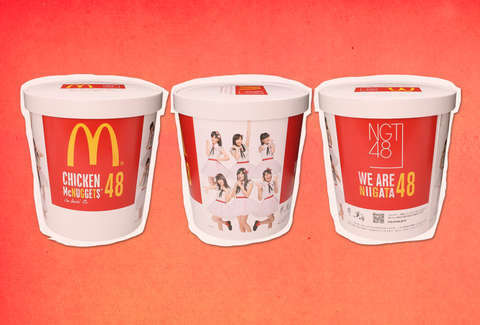 That's because the 48-piece McNugget bucket is part of a promotion for the pop-group NGT48. Neglecting two lonely nugs is part of the plan, you see. The KFC-styled buckets are only available in the country's Niigata Prefecture, which means one Japanese locality is now luckier than all others. The chain previously offered the exact same promotion with NGT48 in 2015. The buckets will become available in December, giving the people of Niigata a glorious case of deja vu. Now, this isn't to say you should despair the unfairness of it all, but it'd be perfectly fine if you did.